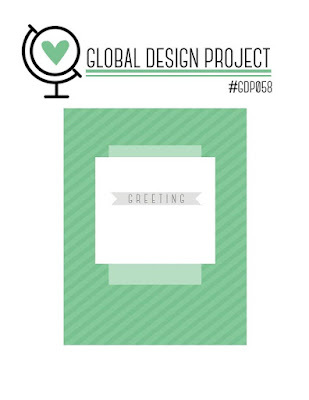 Today I'm playing along with the Global Design Project #GDP058 sketch challenge. I have used the Serene Scenery Designer Series Paper with Delightful Dijon cardstock for this card & while Delightful Dijon is not one of my favourites, I still think this card turned out really pretty! What do you think? I've used a Thick Whisper White cardstock base, layered with Serene Scenery DSP & Delightful Dijon cardstock. I have White heat embossed the sentiment from the Flourishing Phrases stamp set. I have also propped the top layer up on Dimensionals. I have stamped the inside of the card & the envelope with the flower from the Flourishing Phrases stamp set in stamped off Delightful Dijon. I have also stamped off the Old Olive on the leaves but left it full strength on the sentiment. Although I haven't used them on this card, the Flourishing Phrases stamp set also comes with beautiful matching framelits! I have also entered this card into the Crazy Crafters Project Highlights for this week. You can see all the entries & vote for your favourites from 7:30pm tonight. All of these products are from Stampin' Up! & are available from my online shop. Remember to use my October Hostess Code AMCFCNZT at the bottom of your Shopping Cart & get a Free Gift from me at the end of the month! Please note, you must reside in Australia to order from me.